Alberto Mina is a Brazilian professional Mixed Martial Arts (MMA) fighter. He currently competes in the Ultimate Fighting Championship (UFC), under the Welterweight division. He is one of the successful mixed martial artists with the record of 14-13-1. Alberto Mina was born on 2nd of May 1982, in Campina Grande, Paraiba, Brazil. His star sign is Taurus. By nationality, he is a Brazilian, and his ethnicity is under-review. At the tender age of five, Mina started off his MMA career, when his parents decided to make him learn some sports to make him active as a kid. First, he learned Judo, and since a young age, he started being noticed due to his competitiveness and sense of discipline inside the dojo. Mina holds Bachelor's degree in Sports Science and has a Post-Graduate degree in Physiology. Alberto Mina has earned his wealth widely through his professional MMA fighting career. At present, he is signed to Ultimate Fighting Championship, and his UFC earning are given below in the table. His UFC career earnings is reported to be $ 133,000. However, Mina has not disclosed his exact figure of net worth but looking at his prosperous career, his net worth is assumed to be a seven-digit figure. In 1997, Mina switched to jiu-jitsu under the guidance of Roberto Fialho. At his teenage, be able to compete and win in numerous Jiu-Jitsu championships. As a natural sportsperson, Mina also practiced and competed in Volleyball, Swimming, Handball, and Judo, always seeking ways to improve to start his career in Mixed Martial Arts. With over fifteen years of experience, Mina is now a third-degree Judo Black Belth and Third-degree Jiu-Jitsu Black Belt, representing Draculino Fight Team. More, he is the winner of Asian Open Championship twice, in 2015 and 2016 at Welterweight, as well as has participated in other events including Abu-Dhabi Pro. In 2005, Mina joined the Jean Silva Combat Team. He made his professional MMA career debut against Jeferson Fibiru at Cage Fight Nordeste on 31st May 2005. He won the fight via armbar submission in round one. 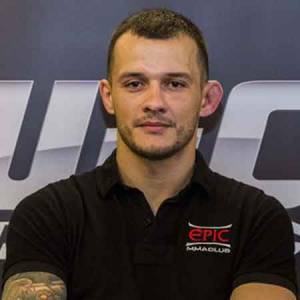 He amassed a record of 10–0 combined with periods of inactivity, competing for several regional promotions around the world including Intense Fighting, ZTFN, MCVT, UCMMA, UFG, Rebel FC, and Instigacao Fighting, before signing with the UFC in January of 2014. On 23rd of August 2014, Mina made his UFC debut at UFC Fight Night: Bisping vs. Le, where he defeated Shinsho Anzai via TKO punches in the first round of the bout. He next faced Yoshihiro Akiyama at UFC Fight Night: Henderson vs. Masvidal on 28th November 2015. He won the fight via split decision. His third UFC fight came on 7th July 2016, at UFC Fight Night: dos Anjos vs. Alvarez. He defeated his opponent, Mikie Pyle via KO in the round two. On 12th May 2018, Mina faced Ramazan Emeev at UFC 224. He lost the fight via unanimous decision in the round three. Standing six feet tall, Alberto Mina weighs 77 kg. Currently, he is thirty-six year old and enjoying his singlehood. Thus far, the fighter has not been spotted in public or social media sites with a lady, who is assumed to his girlfriend or spouse. It seems that Mina is quite a confidential persona and prefers to maintain his private life far from media’s eyes.